One question we have seen multiple times in e-mail and in the forums is: what is the difference between the Supermicro AOC-SLG3-2E4R and Supermicro AOC-SLG3-2E4 NVMe expansion cards. 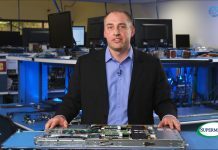 Users are looking for ways to efficiently use available PCIe resources to add NVMe capabilities. 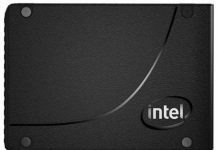 The 2.5″ SFF NVMe drives have the potential to add more drives to a system than their add-in-card (AIC) PCIe x4 counterparts. As a result, many users are looking to add NVMe expansion capabilities to their existing systems yet there are few currently available options. 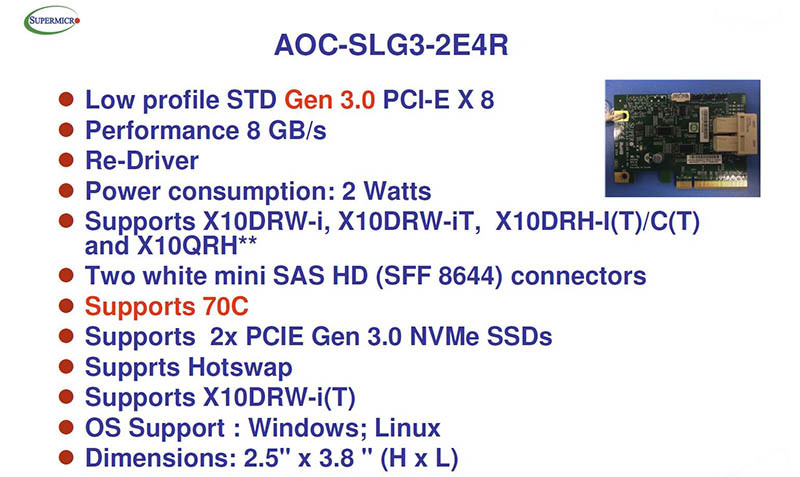 Two options we found as part of earlier research were the Supermicro AOC-SLG3-2E4R and Supermicro AOC-SLG3-2E4. Information was sparse on these so we did a bit of digging and have the differences. 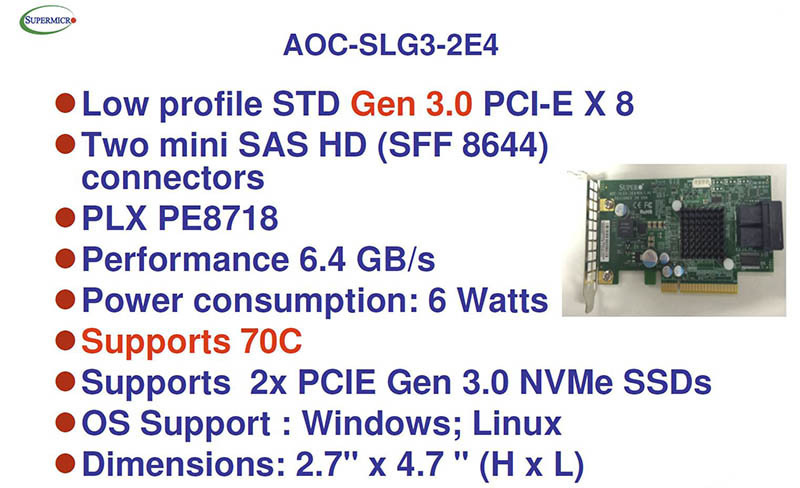 The Supermicro AOC-SLG3-2E4 has a PLX PEX 8718 chip to handle adding two PCIe x4 SSDs into a single PCIe x8 or x16 slot. PLX (now part of Avago) makes PCIe switch chips that help aggregate PCIe lanes when a CPU’s PCIe controller would otherwise be maxed out. The PEX 8718 is a 16 lane 5 port PCIe 3.0 switch (specs here.) 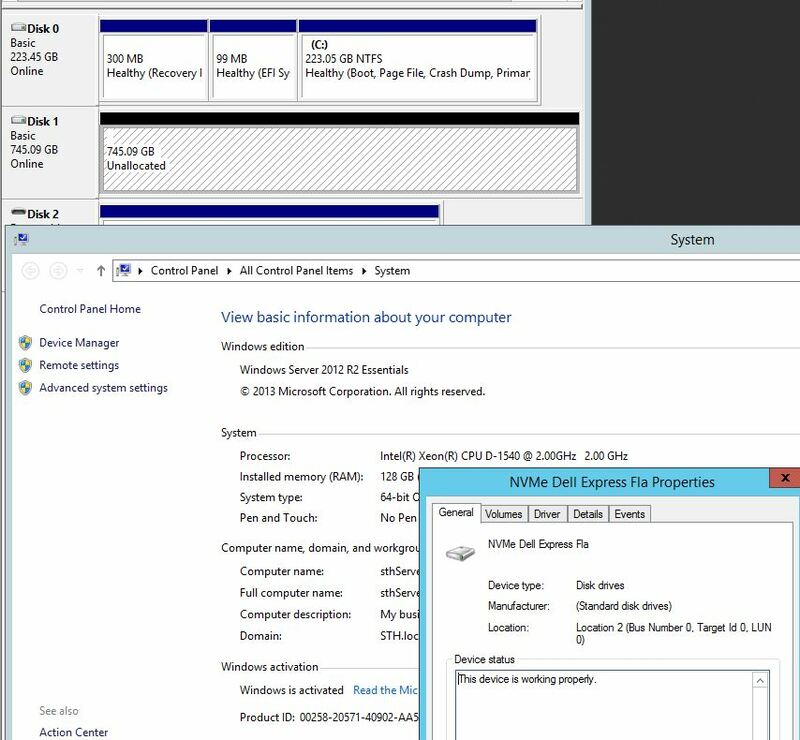 That makes sense with two x4 lane sets going to the drives and x8 going to the host. This is certainly the more complex of the two and costs $100 more at $249 on Amazon or ebay. The Supermicro AOC-SLG3-2E4R – $149 (Amazon or Ebay but I got from ebay) is a lower cost part with no PLX chip onboard. It also therefore consumes less power but has a much tighter compatibility matrix. 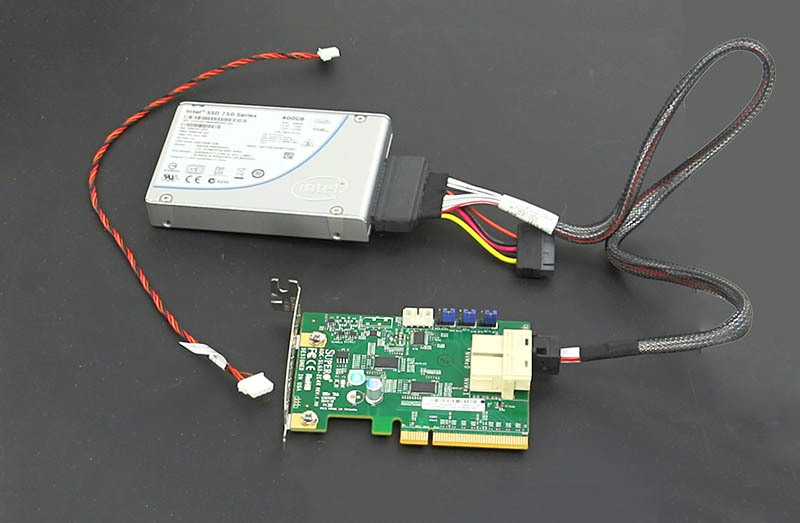 In a quest to add 2.5″ SFF PCIe/ NVMe capabilities to existing systems we started working on an experiment with the lower cost AOC-SLG3-2E4R and an Intel 750 400GB SSD which comes with the required cable. 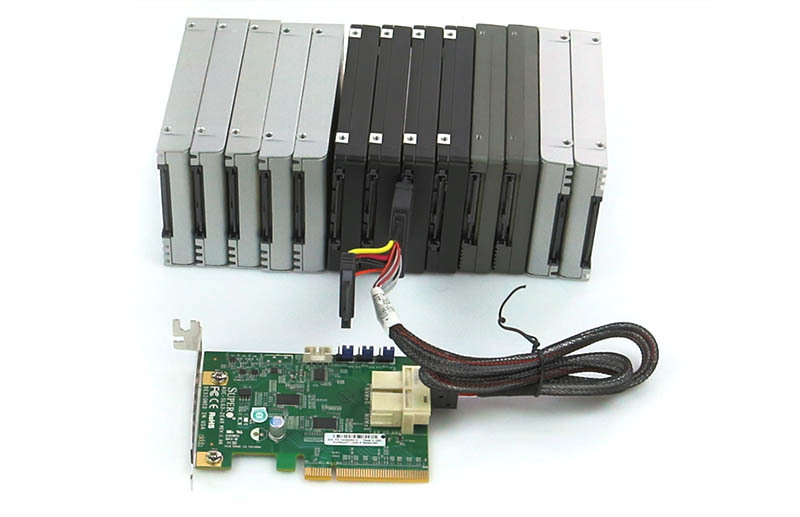 We were cable limited, not drive limited but were able to test the card with a variety of single drives. We did see a few issues on motherboards without PCIe switch chips. Right now we are thinking the AOC-SLG3-2E4 may be the better option from a compatibility standpoint. We should have a card by the second week in June to verify. Keep checking this thread in the STH forums for more updates. One potentially interesting implication is that a 32 lane PLX PCIe switch chip could be used to build a PCIe x16 to 4x NVMe card or the technology could potentially allow over subscription of drives to PCIe lanes, greatly enhancing the ability of server vendors to add more PCIe SSDs. 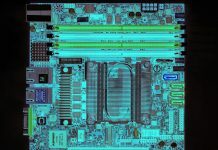 Any testing with the AOC-SLG3-2E4R performed on the SuperMicro X9 series? X9SCM-F for example? Any way you think I could tell if it worked before buying?